Our guide to Las Vegas will help you find the best budget hotels in Las Vegas Nevada. Where can you see Paris, Venice, New York and even ancient Egypt, in one day? It's Vegas, baby, where the neon glares, the slots chime, the shows dazzle, and the scenery offers an eye-popping reconfiguring of the world's iconic destinations. Hedonism reigns here, and although the city is truly a bastion of artifice, Las Vegas travel guides from around the world agree that it's a testament to America's ability to go over the top. Sure, you've heard that what happens in Vegas, stays in Vegas -- and you'll surely help put the 'sin' in Sin City. But when you're ready to jump off the bar and curb your gambling habit, plenty of fun awaits you: luxurious spas, quirky museums, lavish pools, and gut-busting buffets. There are tons of great budget hotels in the city of Las Vegas, our city guide will help you find the best budget hotels. You may have a hard time deciding what to do in Las Vegas, but we make your decision easy. 1000 N Main St, (702) 382-3455 - Best Western Main Street Inn is a budget hotel / motel / resort located in Las Vegas NV. 1401 Las Vegas Blvd S, (702) 388-0301 - Howard Johnson-Las Vegas Strip is a budget hotel / motel / resort located in Las Vegas NV. 167 E Tropicana Ave, (702) 795-3311 - Americas Best Value Inn is a budget hotel / motel / resort located in Las Vegas NV. 2028 Fremont St, (702) 313-3280 - Economy Inn Motel is a budget hotel / motel / resort located in Las Vegas NV. 230 Hidden Well Rd, (702) 407-0075 - Homewood Suites is a budget hotel / motel / resort located in Las Vegas NV. 3225 Paradise Rd, (702) 796-9300 - Residence Inn Las Vegas Convention Center is a budget hotel / motel / resort located in Las Vegas NV. 3500 Paradise Rd, (702) 731-2020 - Best Western Mardi Gras Hotel & Casino is a budget hotel / motel / resort located in Las Vegas NV. 3961 Las Vegas Blvd S, (702) 739-1777 - Motel 8 is a budget hotel / motel / resort located in Las Vegas NV. 4035 N Nellis Blvd, (702) 644-5700 - Holiday Inn Express Las Vegas Nellis is a budget hotel / motel / resort located in Las Vegas NV. 4270 S Valley Vw Blvd, (702) 221-7600 - Extended Stay America is a budget hotel / motel / resort located in Las Vegas NV. 4350 Paradise Rd, (702) 938-2000 - Comfort Inn Las Vegas is a budget hotel / motel / resort located in Las Vegas NV. 4640 E Tropicana Ave, (702) 433-5880 - Springhill Suites is a budget hotel / motel / resort located in Las Vegas NV. 4970 Paradise Rd, (702) 798-5530 - Best Western McCarran Inn is a budget hotel / motel / resort located in Las Vegas NV. 5100 Paradise Rd, (702) 212-1955 - Knights Inn-Airport is a budget hotel / motel / resort located in Las Vegas NV. 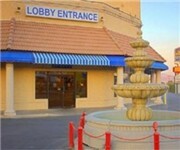 5330 E Craig Rd, (702) 643-6111 - Best Western Nellis Motor Inn is a budget hotel / motel / resort located in Las Vegas NV. There are plenty more budget hotels in Las Vegas. See all budget hotels in Las Vegas Nevada.